I just finished reading a new book titled Europe With Kids: How to Travel Europe the Easy Way by Carolyn Schonafinger, who also hosts the website Holidays to Europe from her home in Australia. 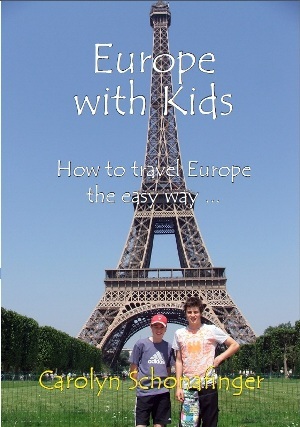 Schonefinger has traveled frequently to Europe with her husband and two sons, and writes passionately about planning, budgeting, booking, and undertaking a family holiday to Europe. The basics are all covered in this handy little book, such as getting a passport, what to pack, and sightseeing highlights in many countries. But Schonafinger writes about an accommodation option in Europe that I had not considered: luxury camping, and, in her experience, luxury camping with a company called Eurocamp. Eurocamp offers campsites in 13 European countries where travelers can rent cabins, tents, mobile home units, or a variety of other housing in a campground setting often with swimming pools, kids' clubs, mini-golf, and more. I immediately checked out some of these locations, especially in Spain and Portugal where we're headed this summer, and the sites look clean and very kid-friendly! The prices are generally cheaper than hotel rooms and apartments, and one location in the Algarve in Portugal was just about near enough to one of our stopovers that I would've booked it just for the experience had it been about 40 miles closer. Schonafinger and I share the same ideas about eating in Europe, too - it's often least expensive to pick up grocery items at the local supermarket and pack lunches, snacks, and even prepare meals in the kitchen of your apartment if you have one. The author's firsthand knowledge of traveling with her family in Europe makes this book a terrific reference for anyone considering a go at it themselves!